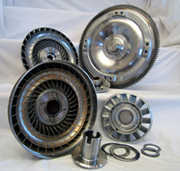 For 19 years, Precision Converters of Ohio has been providing high-quality, re-engineered and re-manufactured Torque Converters to a growing number of Independent Transmission Shops in the mid-west. Our nationally recognized company has a staff dedicated to the design, construction, assembly, and testing of your performance converter to insure that each unit receives the attention to detail and focus on quality that you desire and expect from a premium, performance supplier. We build each of our Converters the same way you would if you had the knowledge, expertise, experience, equipment, and facilities. No units are mass produced. Each and every process is performed in-house. Your converter and every other we produce will be constructed from cutting-edge components specifically designed to maximize the performance characteristic you desire and/or to rectify the inherent flaws of your existing converter.